...a $32 million contract to develop an experimental maneuverable spacecraft platform that will be capable of hosting multiple payloads and operating in low- and geosynchronous orbit. The five-year contract began in the third quarter of 2012. The Evolved Expendable Launch Vehicle (EELV) Secondary Adapter (ESPA) Augmented Geostationary Laboratory Experiment (EAGLE) is AFRL’s newest space flight program. It will consist of an ESPA-based spacecraft bus (EAGLE Platform) and a suite of payload experiments. Capable of launching aboard any EELV variant, the EAGLE Platform will use a six-port standard ESPA ring as part of its structure, thereby improving launch access to geosynchronous orbit, as well as providing a cost-effective modular platform that could be used for geostationary transfer orbit (GTO) or enabling payload hosting for low-orbit operations. Orbital expects its EAGLE platform design will be capable of hosting up to six payloads for a period of at least one year in geosynchronous orbit. The EAGLE Platform may also carry significant quantities of propellant, depending on the eventual launch vehicle selection and orbit maneuverability requirements. Orbital’s family of fully-developed small- and medium-size spacecraft for low- and geosynchronous-orbit is ideally suited for a variety of national security applications, ranging from operational and experimental systems to technology demonstrations. Previous successful missions have included the C/NOFS satellite for the U.S. Air Force, the NFIRE satellite for the U.S. Missile Defense Agency (MDA) and the MiTEx satellite for DARPA. 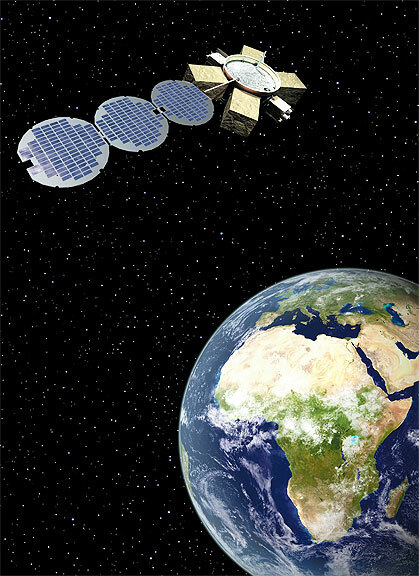 Orbital spacecraft have also been used as vital precursors of future operational systems by retiring significant technical risks, such as for MDA’s STSS-ATRR satellite. These spacecraft platforms and innovative development capabilities, combined with Orbital’s comprehensive product line of small- and medium-class launch vehicles and systems integration expertise, are enabling the company to offer U.S. government customers lower-cost, responsive approaches to missions of national importance.